Nosh like a New Yorker with this DIY bagel and schmear kit. Nosh like a New Yorker with this DIY kit that includes the basics to make classic everything or cinnamon raisin bagels and schmear. Rope, loop, and boil a dozen doughy bagels from scratch and follow up with a healthy helping of tangy cultured cream cheese. Keep yours plain, add swirls of the included cinnamon and raisins, or spice things up with the everything bagel seasoning blend (minced onions and garlic, sesame and poppy seeds, and flaky salt) for a homestyle breakfast treat that tastes as if it's straight from an old-fashioned delicatessen. Assembled in Brooklyn. 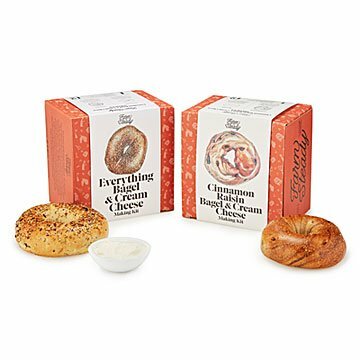 Click here to learn how to make the Everything Bagel & Cream Cheese Kit or the Cinammon Raisin Bagel & Cream Cheese Kit. Makes 12 bagels and 1.5 lbs of cream cheese. Needed but not included: milk, cream, yogurt, and egg. Requires a food processor and baking mat. We didn't discover we needed a baking mat or a food processor until we opened this kit and visited the website. Since we have a small-ish kitchen, we had neither (we used a handy blender stick for things like food processing pesto). We actually ordered a four cup food processor just for this recipe for nearly 100 dollars only to discover you need a much larger one. I also don't love that the recipe is exclusively online, forcing you to use a screen while baking, so it would be nice if instructions were printed as well. Packaging is appealing and directions are easy to understand. So, the process was not entirely-stress free. We could only find ultra-pasteurized heavy cream! Were we rolling the bagels right? But you can't argue with results. Sitting down to eat a meal of bagels with a schmear that you made from scratch is amazing. Next time, it'll be easier. Yes I would buy & make again! Im originally from NY & was very surprised how authentic these bagels & cream cheese turned out! My loving husband made these for me for Valentines Day. He said it was a bunch of work but the smile on my face and hot bagels in the morning made it worth it! I bought this as a gift to make with my dad, as he loves bagels. The cream cheese came out softer than expected, but tasted very good. The bagels turned out a little small. The instructions say to mix the dough in a food processor, but there is no way all the ingredients would fit, so we used a stand mixer instead. This was brought as a gift and they are VERY happy with it. I am happy with this gift as my daughter travels a great deal and it helps her to relax in her apt and prepare her own bagels - it gives her time to do somethings while she is relaxing and winding down from busy days.